Wolfe, the largest LGBT film distributor, acquired U.S. rights to Mackey Alston’s “Love Free or Die” on DVD and VOD at the Outfest Film Festival Tuesday. Alston received a special jury prize at the 2012 Sundance Film Festival for his work in directing the film. SAN JOSE, CALIF. (July 25, 2012) — Wolfe Video has acquired the U.S. DVD/VOD rights from Cinephil to the award-winning documentary Love Free or Die at this year’s Outfest: The 30th Los Angeles Gay and Lesbian Film Festival. Director Macky Alston (Family Name, Hard Road Home) was awarded a Special Jury Prize at the 2012 Sundance Film Festival for Love Free or Die. 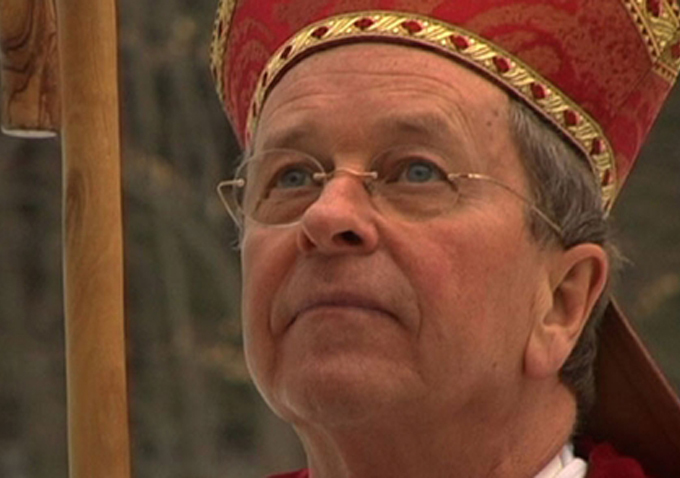 The film follows Bishop Gene Robinson amidst the firestorm of international controversy that followed his ordination by the New Hampshire Episcopal Church as the church’s first openly gay bishop. Hailed as: “a moving look at how even a rigid church with centuries of entrenched methodology can begin a slow shift towards inclusiveness and equality” (Daniel Fienberg, HitFix.com), the film depicts how Robinson, while resolute in his calling, grows increasingly critical of the central role that religious institutions have played in fostering homophobia and hatred. The film will be available for educational/non-theatrical screenings beginning in October through Kino/Lorber in partnership with Wolfe, followed by airings on PBS stations nationwide as part of the series “Independent Lens.” Wolfe will release the film on DVD/VOD in 2013. For more information on the film, visit http://www.lovefreeordiemovie.com/. For more information on “Independent Lens,” please visit http://www.pbs.org/independentlens/. SYNOPSIS: Love Free or Die (Special Jury Prize winner Sundance 2012) is about a man whose two defining passions the world cannot reconcile: his love for God and for his partner Mark. It is about church and state, love and marriage, faith and identity—and one man’s struggle to dispel the notion that God’s love has limits. In the film, Gene Robinson becomes the first openly gay person to be elected bishop in the high church traditions of Christendom. Bishop Robinson’s elevation in the sleepy New Hampshire diocese in 2003 ignited a worldwide firestorm in the Anglican Communion, one that has become so heated that there is still a chance of a schism in the 80 million-member denomination. One year after being muzzled by the Archbishop of Canterbury, he finds himself speaking from the steps of the Lincoln Memorial at Barack Obama’s Inauguration. Gene Robinson confronts those who use religion as an instrument of oppression, and claims a place in the church and society, not just for LGBT people, but for all. ABOUT WOLFE Serving customers since 1985, Wolfe is the largest exclusive distributor of LGBT films. Recent major Wolfe titles include: Sundance Audience Award winner, Undertow (Peru’s submission for the Academy Awards); the wildly popular Berlinale Teddy Award winner, Tomboy and 2012 Sundance hit Mosquita y Mari. Wolfe is also well known for the DVD releases of such beloved classics as Desert Hearts, Big Eden, Were The World Mine and A Marine Story. Wolfe’s acclaimed motion picture library can be found at WolfeVideo.com as well as at national retailers such as Netflix, Redbox, Barnes & Noble, Amazon and VOD destinations such as Comcast, Time Warner, YouTube Movies, Hulu, iTunes and, of course, via the global LGBT movie viewing platform: WolfeOnDemand.com.